What a powerful book! Owen provides a thorough exposition of Romans 8:13 challenging the believer to examine himself and how he is working to not just fight, but kill, his sin. Owen shows us why we should be killing sin, gives methods for killing sin, and tells us why this can only be done by looking to the cross of Christ and relying on the Holy Spirit. This book was deeply convicting and intensely practical. A must-read for any follower of Jesus! This is a great read whether you are single, dating, or married. Tim and his wife Kathy debunk common marriage myths, explain the mission of marriage, and show how marriage is a picture of the gospel. Then they offer practical advice to help prepare for marriage if you are unmarried or to work through tough patches, love and understand your spouse more fully, embrace your identity as man or woman, and confront your own self-centeredness and wounds if you are married. I especially appreciated the “Essence of Marriage” chapter in which Keller defines what true love is and how a covenantal marriage doesn’t stifle love, but allows it to find its fullness in promise and action towards a spouse. This book is basically a MythBusters for marketers. Sharp and his team debunk theories that most marketers are taught in college by showing that they don’t exist in the real world. For example, he says that the main thing brands should focus on is availability (both mental and physical) and not differentiation or niche marketing. He also discourages the use of price promotions which lead to short-term sales boosts, but no measurable long-term growth. In a field commonly thought of as an art, Sharp shows that there are scientific laws and trends that can be applied to building a brand. Sharp outlines seven rules that have been shown to actually help brands grow. Whether you are studying marketing in college or have been building brand for decades, this is a book that you need to read to make the best use of your resources and create an enduring brand. I’d definitely encourage you to read at least one of these books next year. If you’d like to keep up with what I’m reading now and what I’ve read in the past, check out my Goodreads profile. Happy reading! 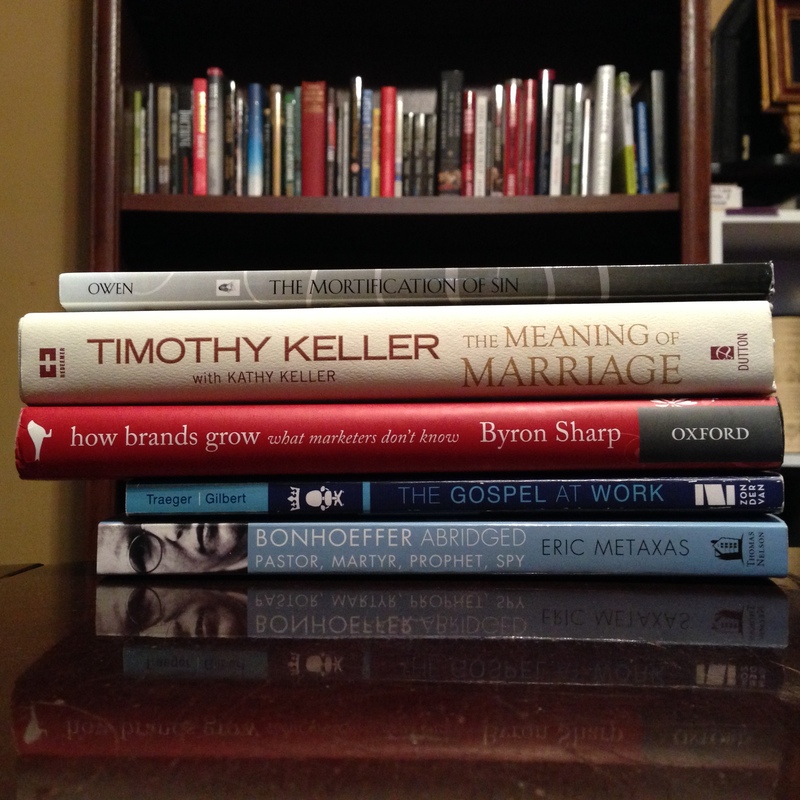 Have you read any of these books or do have a book that would recommend reading in 2015? Share your thoughts in the Comments below. The average person will spend over 90,000 hours of their life working. 90,000 hours! To put that in perspective, it would basically be like clocking in today and working non-stop for just over 10 years before clocking back out. Not only does our vocation consume a significant amount of our time, it is also part of our identity. One of the first questions I always get asked when I meet someone new is: “What do you do for a living?” For better or worse, we are associated with the work that we do. Many people tend to compartmentalize their lives. There’s a Work compartment, Family compartment, Friends compartment, Hobby compartment, and so on. We do our best to keep the different areas from overlapping. However, for Christians, there is one compartment that should pour over into all the others–or rather be the foundation for everything else: our faith in Jesus Christ. In 1 Corinthians 10:31, Paul writes, “So, whether you eat or drink, or whatever you do, do all to the glory of God.” According to this, everything we do throughout a given day should be based on the gospel and done to bring glory to God and not ourselves. Subscribe to be the first to know when a new blog post is published!